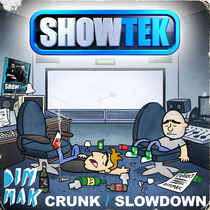 Wouter and Sjoerd are back again with ‘Crunk’ and ‘Slow Down’, out March 5 on Dim Mak Records. ‘Crunk’ is an all-out high-octane jump house anthem and ‘Slow Down’ is a heavy progressive track with a trance inspired melody. Never a pair to be tied down into any one field, Showtek cite influences from rock and hip-hop to house and euphoria on their productions. On the eve of 2013, ‘Hey!’ was unleashed to the world and was met with positive reviews from fans and specialists all over the world, propelling the Dutch brothers straight to the US. With a large North American fanbase, built up over years of touring, the duo have held a special place for the home fans that have shown continued support for their productions, keeping them in a firm position at No.5 in the Dutch Top 40.